Nina’s latest science fiction thriller Outer Diverse launched at Con*Cept in Montreal on October 15th, also its official release date with amazon and other bookstores around the world. 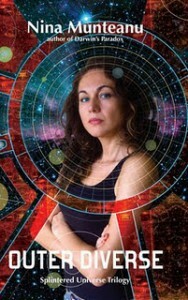 Outer Diverse is the first book of her Splintered Universe Trilogy, set in and around the Milky Way Galaxy. Outer Diverse starts the story of Galactic Guardian Rhea Hawke, tasked to investigate the massacre of an entire spiritual sect. Her investigation leads her into a treacherous storm of politics, conspiracy and self-discovery. Rhea’s quest for justice catapults her into the heart of a universal struggle … and towarad an unbearable truth she’s hidden from herself since she murdered an innocent man. Outer Diverse is currently available at Amazon, Barnes & Noble and other bookstores near you.